A new Smithsonian Channel documentary (Bird vs. 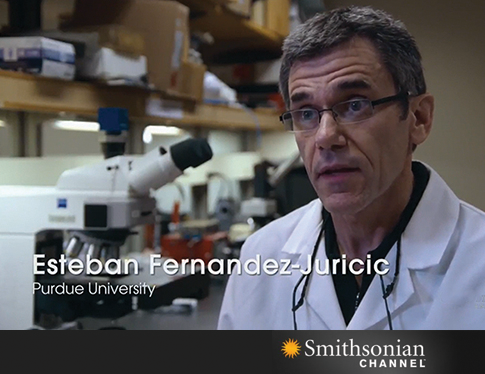 Plane: Miracle on the Hudson) aired recently featuring different aspects of Prof. Esteban Fernandez-Juricic. The documentary explains the safety dangers of airplane collisions with birds (also known as bird strikes). One of the potential solutions to minimize the risk of collisions is to use lights to deter birds from airplanes. Given the substantial differences between human and bird vision, Prof. Fernandez-Juricic explains that developing these lights requires understanding of how bird with high frequency of bird strikes perceive them and conducting behavioral assays to assess whether they avoid them (or are even attracted to them). The documentary portrays the work in his lab as well as behavioral experiments conducted at the Ross Reserve.